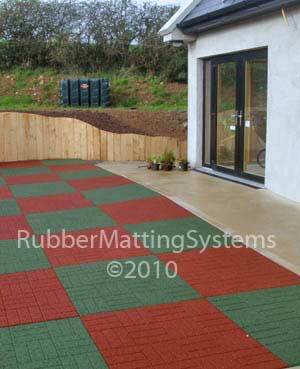 Each large 1m x 1m x 35mm rubber safety mat creates the appearance of brick paving design. Our 35mm deep rubber playground mats are 1mx1m in size, weigh 30kg each and are designed for commercial, public and domestic playgrounds. Our 35mm playground mats have a high safety rating. they will provide a 0.75m Critical Fall Height when placed on a hard base such as stone, tarmac or concrete. 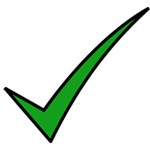 The critical fall height is determined by indepenant testing. It is the height that a child could fall from, without sustaining a critical injury, when landing on a particular safety surface. 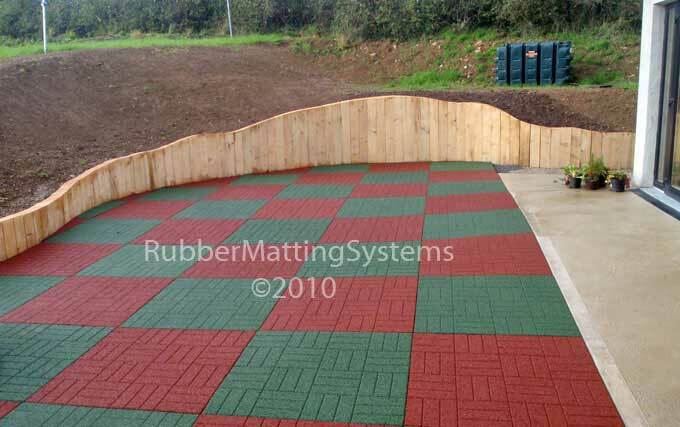 Our 35mm safety matting system will provide sufficient protection against injury in gardens, creches, schools and local authority playgrounds. We manufacture to order other depths of rubber playground mats eg 60mm, 80mm and 100mm for higher critical fall heights.